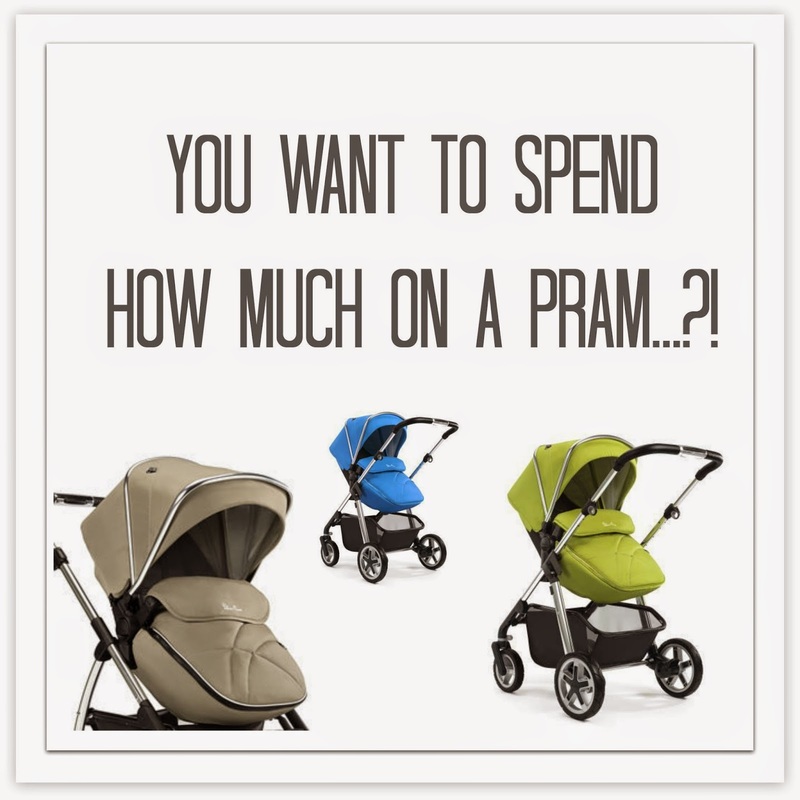 You Want To Spend How Much On A Pram…?! …Was the Hubster’s reaction when I showed him a couple of transportation systems for our precious little growing bean. This was shortly followed by a few words (one beginning with the letter F, that I can’t really disclose here, I wouldn’t want to lower the tone) along with a lot of head shaking as he walked out the room. I sat there confused, wondering what I said wrong. Was I being completely unreasonable to want to splash out on a ‘monkey’s worth of pramette?’ (that classic Mickey Flanagan phrase) Surely he knew this was how much prams cost these days? Particularly really gorgeous ones that come in a zillion different colours, have personalised handle bars, ample shopping storage, top of the range wheels, stylish changing bags and were basically the transformers of buggies that could be morphed into a load of different positions at the click of a button? What the heck was his problem? Even prior to our baby making journey, I’d always eye up the stylish prams that passed me by, checking out the brand and making a mental note to consider it one day when the time finally came. Everybody has their own style and if you’re picky about your handbag then you’re bound to be picky when it comes to the contraption that is going to transporting your baby from A to B. But when the time finally came around to start browsing the pram choices on offer, even I was a little stumped..when on earth do you start? There are so many decisions to make when purchasing the pram, such as how light/heavy the pram is, how easy to fold up/down, how big, the height, how compact when folded, how good/dodgy the wheels are…blah blah, the list goes on. Even then, I’ve noticed that a lot of prams come in about seven different parts, you think you’re getting the whole system, but oh no, that’s just the price for the frame! The actual carry-the-baby compartments, of which there are several to purchase at various stages in the baby’s development, are each sold separately. Along with the rain cover, the umbrella, the changing bag, the wheels, the brakes and any other part of the pram they can squeeze more precious cash out of you. And because you’ve already fallen in love the snazzy pram- you’ll need to have it all unless you want a mismatched pram that looks like it was pieced together in a dodgy Krypton Factor task. The whole process can be totally overwhelming, when all you really need is something simple, yet stylish, like the Silver Cross Wayfarer, with its lightweight frame and nifty little wheels. Or the more sturdy Silver Cross Surf 2 that comes complete with a carrycot and cosy mattress. For anyone who is new to pram shopping, even comparing the same brands is a mind blowing task, which is why I found this article, ‘Which one to choose?’ super helpful where both systems are compared in detail and broken down to assist customers in choosing the right pram. Ahh…and breathe. So as we continue our debate surrounding our pramette of choice, I think I’ll keep on researching, asking advise from friends and most likely have to put together some sort of Dragons Den presentation on ‘prams that I’d really really like’ in order to sway the Hubster in the right direction. Wish me luck! Did you have trouble deciding on the perfect pram? Let me know in the comments below…! Disclosure: This is a ‘guest post’. Thank you for supporting the brands that make this blog possible. Images sourced via www.babydino.com.